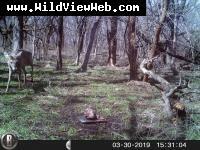 It is fun to capture and share your new trail cam pictures with friends. Become a member by logging in then submit a trail cam pictures below. Members can then forward pictures onto friends from the site and add comments. Maybe your entry will be one of this weeks pics and entered into our annual photo contest!!!! 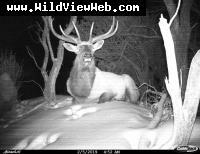 Submit your trail cam photos in our "Member Pics" section to be entered in the Wild View Web annual photo contest. Eligible photos must be submitted by Midnight December 31st. 2019 (Central Time). Weekly winners will be voted on by WVW members March 1st thru March 15th, 2020 to win a portion of $500.00 towards the purchase of a new Wild View Web trail camera. Members will be allowed one voting session to rank the top ten trail cam pictures of the year. The top three winners will be notified late March, 2020. $250.00 for 1st place, $150.00 for 2nd place, $100.00 for 3rd place. or to add or view comments. Strutting Tom. This guy hung around for an hour in front of the camera. Coyote stalk on a rooster pheasant. Boys have been strutting around the house for the last couple weeks. Hope the coming snow does not shut things down for too long.. 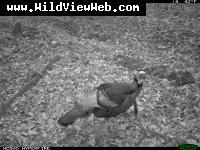 Caught a picture of this silver hen turkey in the back yard. First I have ever seen around the house. Could be fun to get some funky colors in the flock! 1st pic of new growth for 2019. Snow is almost all melted. Time for some spring frost seeding.